Merry Christmas and a wonderful New Year for 2010! 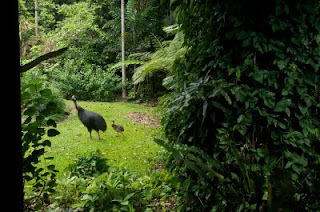 We had more visits from the Cassowary and his chick, -here he walks across the front path of the house-much to the delight of our B&B guests and ours as well. The mangoes are nearly finished and we probably won't see him then for a while. We also had an inflight accident by a beautiful white tailed kingfisher. Birds can crash into our high windows,-a good reason not to clean them too well-, that is when Marion springs into action with Bachs rescue remedy and the birds, which are stunned and groggy respond very well to this. This little fellow took a bit more time, enough to have a photo taken. Then he took off into the forrest again. 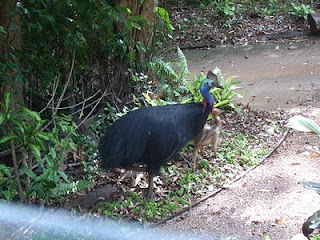 well, with all the mangoes we had off our old trees at the creek bank this year,we found ourselves close up and personal with a cassowary and his chick for most of this week. He arrives midmorning, always very sudden and feeds on mangos, which have fallen in the last 24 hours, with the little chick, stripes and all ,running around him. When we don't watch him he is very relaxed, but seems to notice 4 humans staring at him in amazement. The photos are courtesy of http://www.danielchinphotography.com/. Daniel and his lovely wife Jeannie stayed at the B&B and Daniel took the photos. What thrill for all of us.